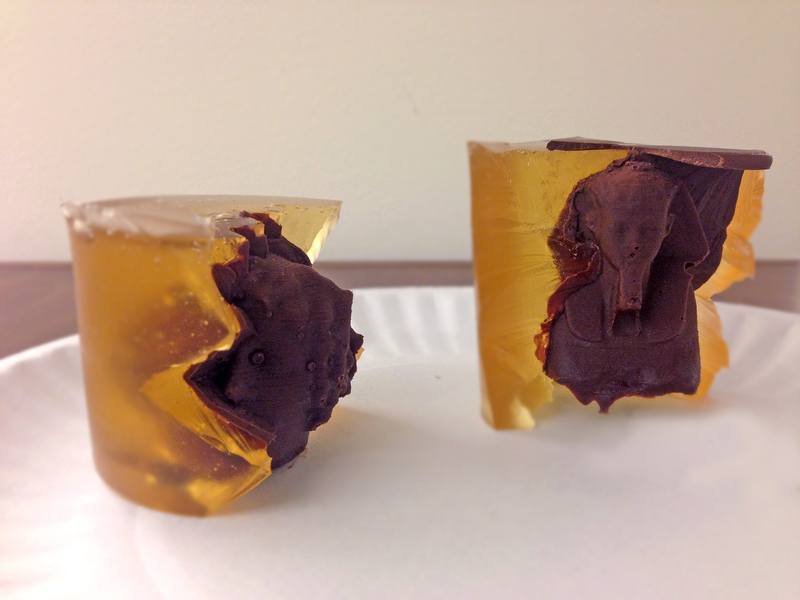 For our fall 2014 MediaLab fellowship, my research partner Yuanjin Zhou and I collaborated to create Edible MET, a DIY, food-grade molding and casting kit that turns artwork into food. We were interested in creating a multi-sensory experience which allows museum visitors to touch, smell, and even taste artworks found inside the museum. We believed visitors would pay closer attention to the physical details of an artwork when they experience it with all senses. We found various types of 3D food printers, including Foodini, ChefJet, and Cand. Although most 3D food printers cost thousands of dollars, the results of the print are disappointing - they are just food purees that got squeezed out layer upon layer. We searched for alternative ways to make 3D edible objects and we settled on a more traditional approach: molding and casting. 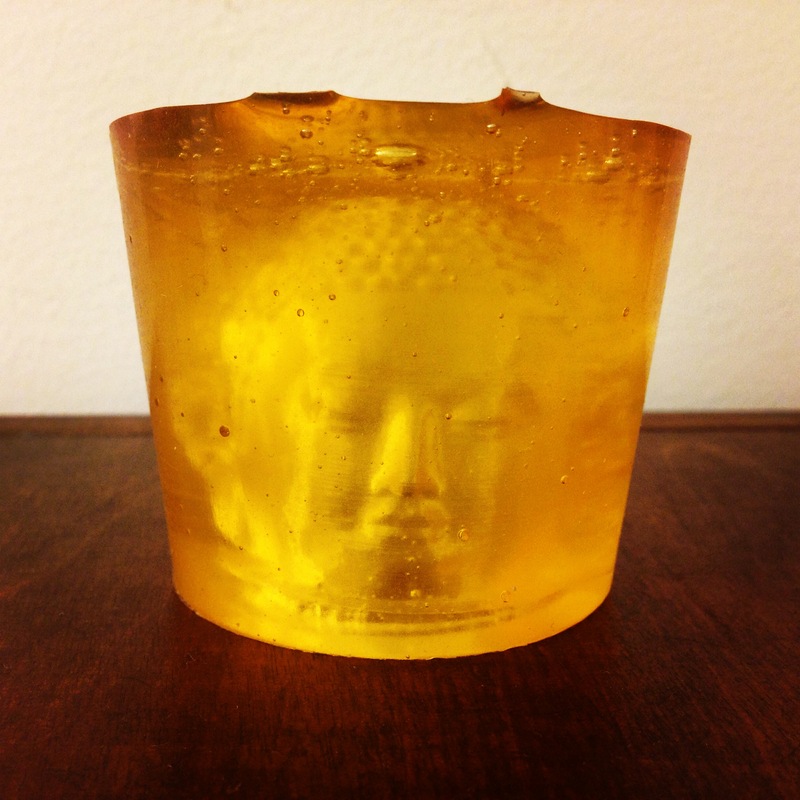 A mold is a hollow form that is filled with a liquid or pliable material to create a decorative shape. As the material hardens, it sets inside the mold and adopts its shape. Since we were making edible objects, the material of the molds must be in food-grade. Luckily, we found ComposiMold, a food-grade, reusable heat-and-pour mold-making material that can be melted and reused over thirty-five times. After receiving some good advice from 3D-printing and mold-making expert Steven Fragale, we began to make our first batch of food-grade molds. 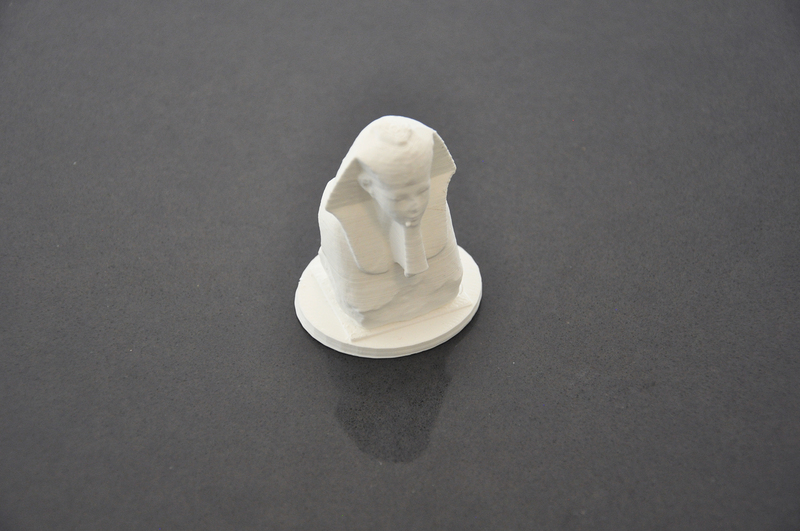 We downloaded some 3D models from the Met's Thingiverse page. Then, we edited the 3D model files using Tinkercad (a 3D-editing software) and printed them out using CubePro 3D printer at the MediaLab. 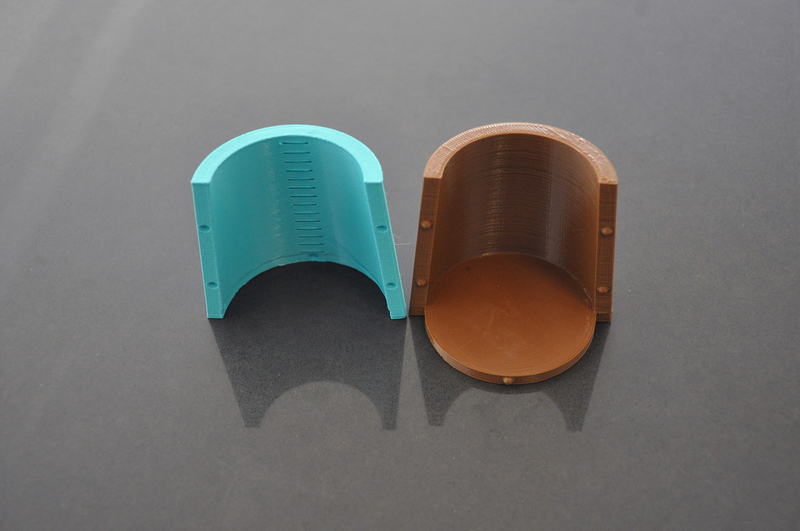 After we printed out the object, we placed it inside an empty holder. 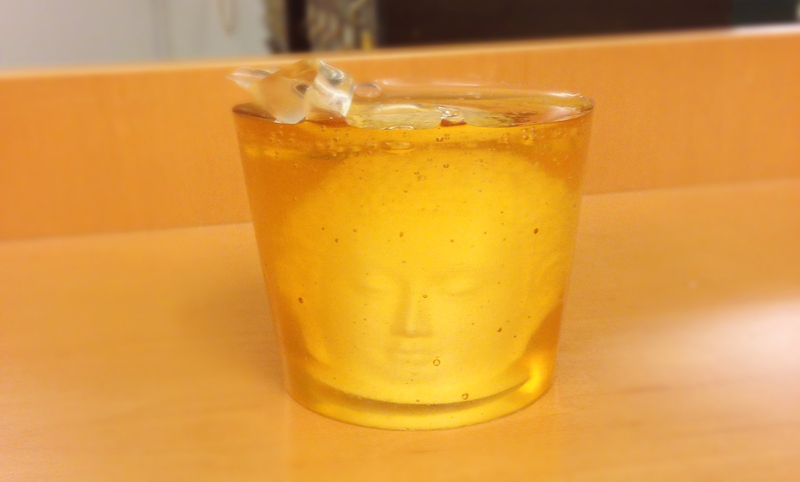 We melted down the ComposiMold in a microwave, and gently poured over the holder. In order to prevent bubbles from forming, we poured the ComposiMold on inner edges of the holder, instead of directly on top of the 3D-printed object. As the ComposiMold hardened, we removed it from the holder and cut the mold we created into two halves. 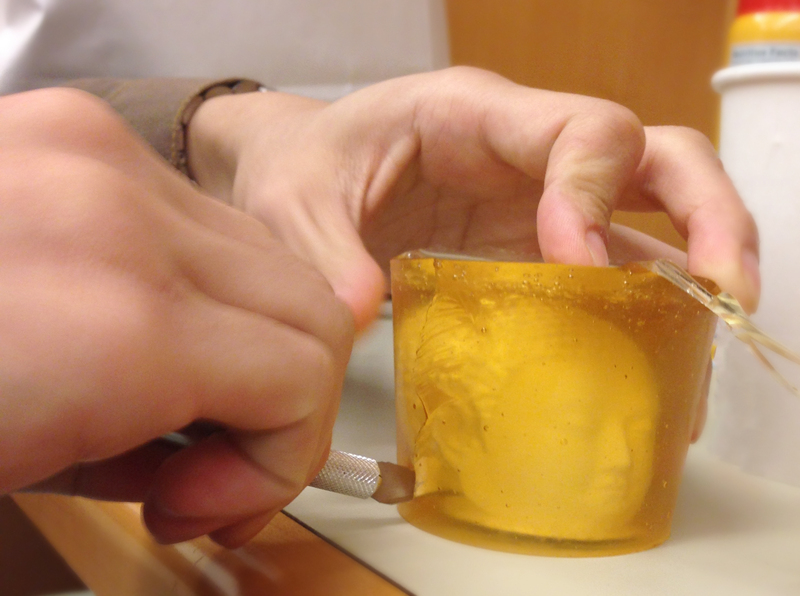 Finally, we carefully removed the 3D object, and the mold was ready to use for casting. We experimented with sweets and pastry during our first round of prototypes by using chocolate and cookie dough. Making molds and casts is relatively common in the pastry world, so we were able to locate a decent amount of information and tutorials. We chose to work with chocolate for our first quick prototype because chocolate is readily accessible and can rapidly solidify. We tempered the chocolate using a microwave oven since it was relatively quick and easy compared to the conventional double-boiler method. After testing various kinds of chocolates, we realized that unsweetened dark chocolate containing 70% cocoa or more worked the best. Before pouring the melted chocolate, we coated our molds with vegetable oil to prevent the chocolate casting from getting stuck to the mold. 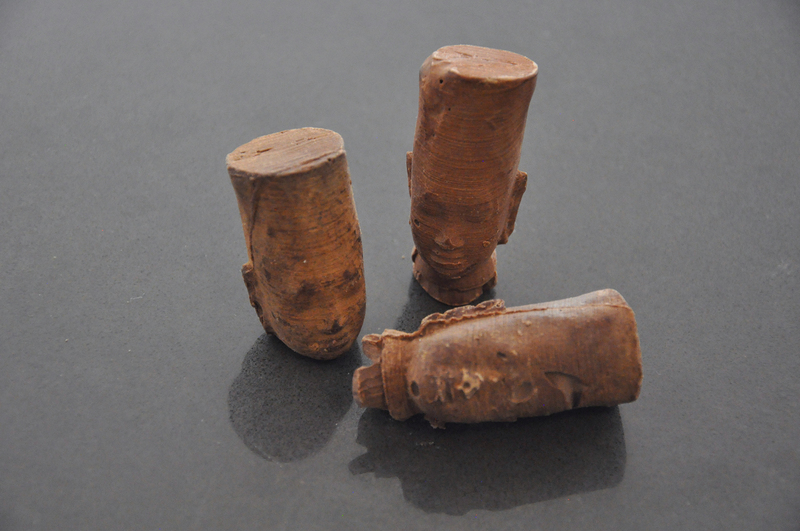 The result was very satisfying; the chocolate castings kept most of the detail of the original 3D objects. Ground beef in the first half of its mold. 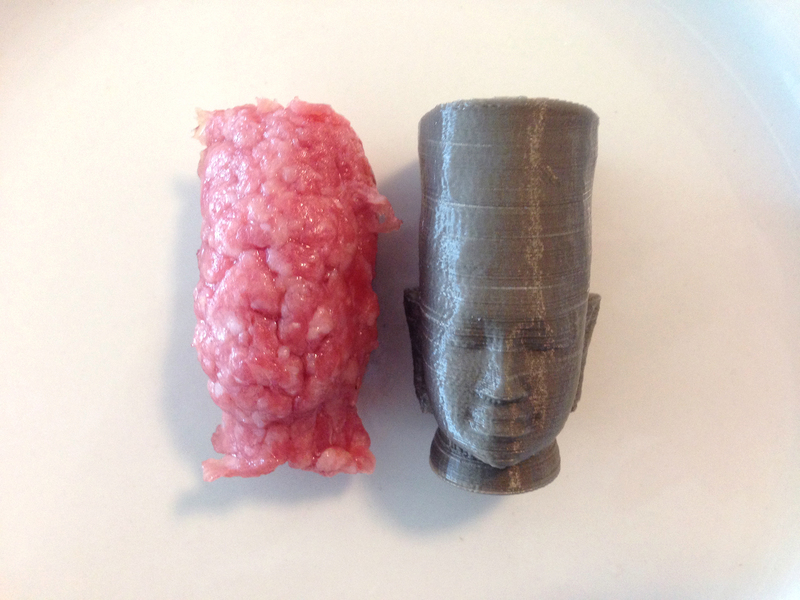 The ground beef casting next to the original 3D object. 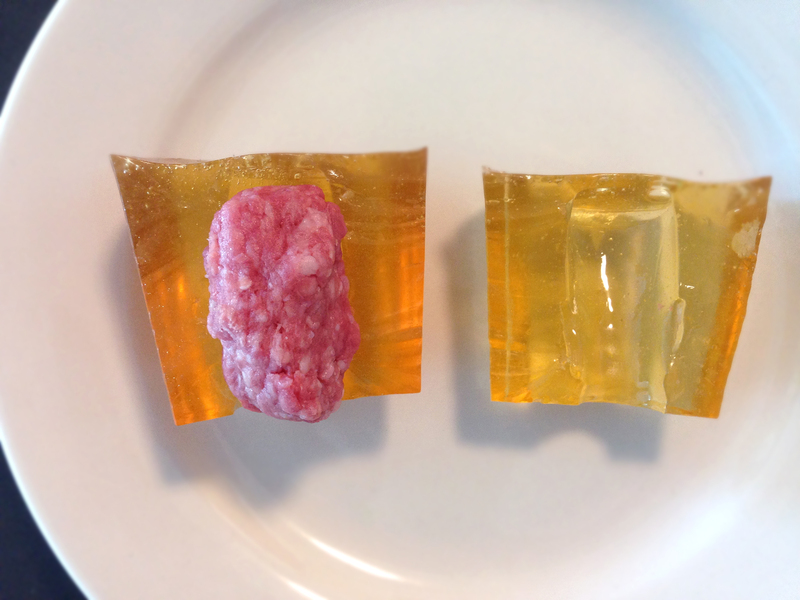 Inspired by Dieter Roth, a Swiss artist best known for his works made of biodegradable materials such as meat and cheese, we experimented with various edible materials in our second round of prototypes and produced castings using ground beef, cream cheese, rice, and banana. We imagined that the final result could be served as a meal and presented together on a plate. 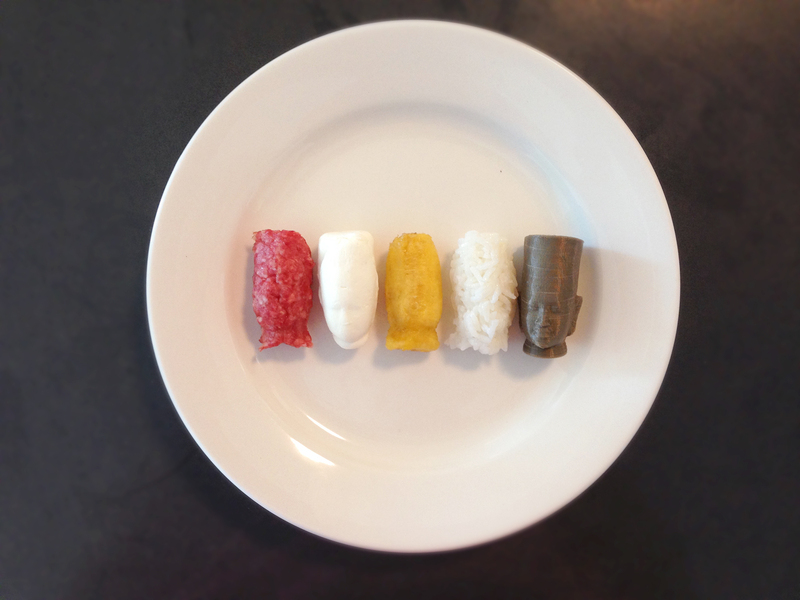 The original 3D-printed object on a plate (at far right) with its rice, banana, cream cheese, and ground beef castings. We wanted to enable museum visitors to produce their own edible artwork. Once we found an optimal method to mold and cast edible artworks, we put together a DIY, food-grade molding and casting kit as a final prototype. 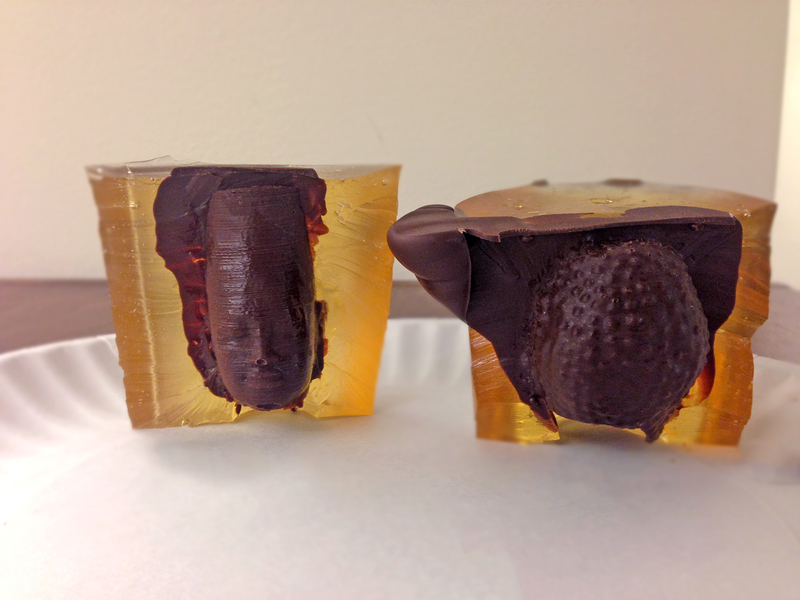 The kit provided all of the materials needed to make custom food-grade molds and chocolate castings. It included ComposiMold, 3D-printed objects, a reusable mold holder, chocolate chips, push pins (for securing the object inside the holder), vegetable oil, and spices. The vegetable oil is used for coating the mold while casting, and the spices were included to encourage experimentation with different flavors. 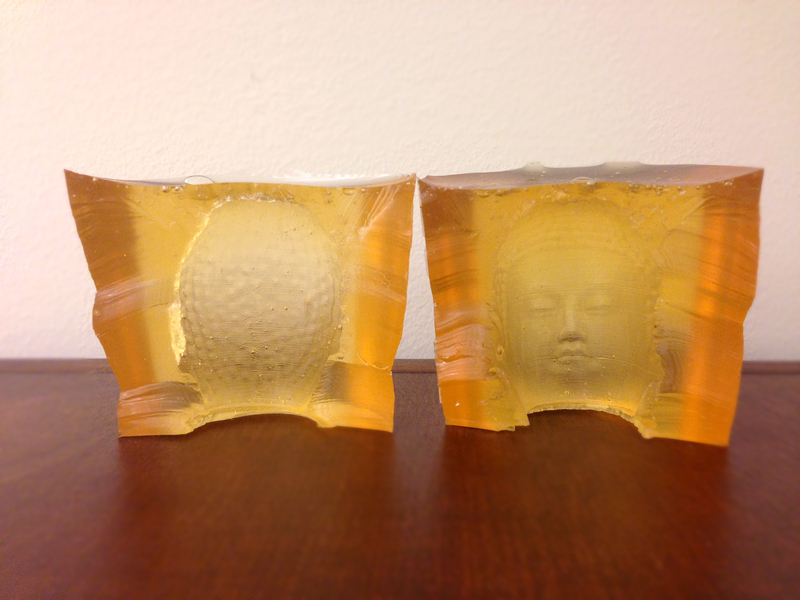 Since ComposiMold can be reused up to thirty-five times, the user can keep remelting and producing new molds. All containers included in the kit were microwave-safe so that the user could simply heat up the molding material and chocolate in a microwave oven. The kit also comes with step-by-step instructions. 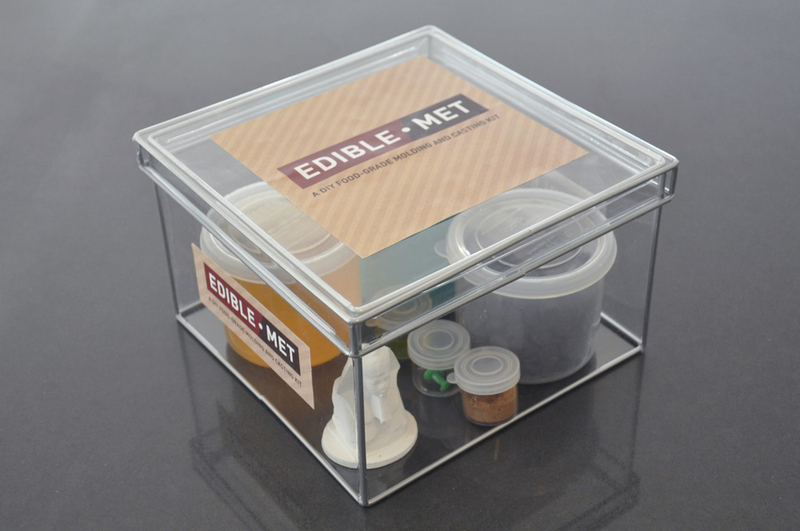 The reusable ComposiMold, chocolate chips, reusable mold holder, spices, push pins, vegetable oil, and 3D object that comes with each Edible MET kit. The 3D printed mold holder. 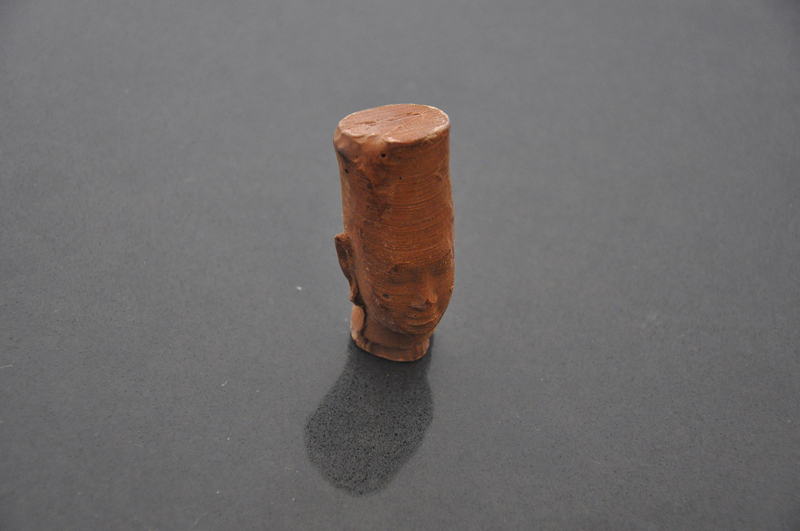 A 3D printed print of a scan of a head of a Pharaoh from the MET. 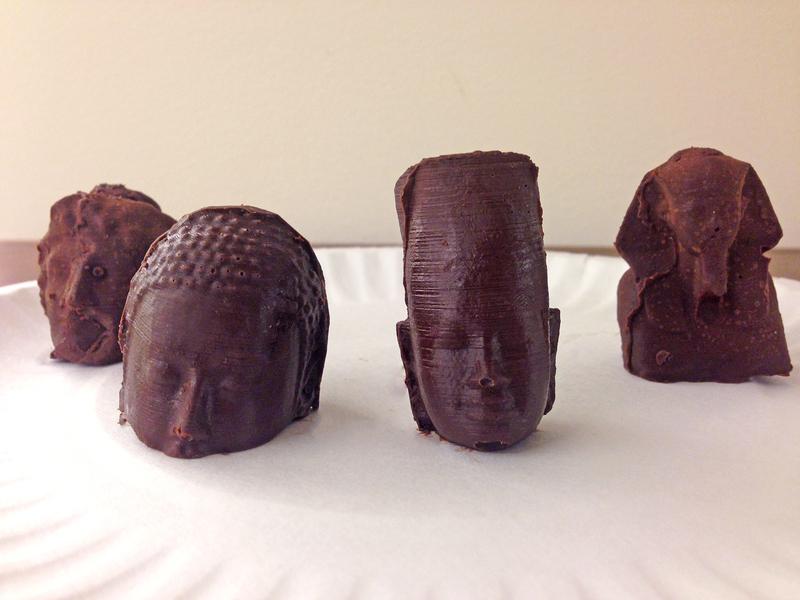 Some chocolate castings using the kit. 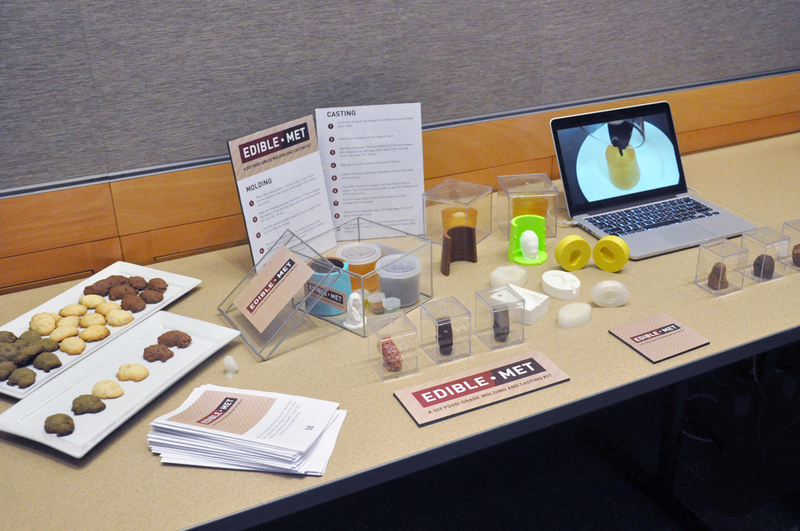 Edible Met debuted at the fall 2014 MediaLab Expo. We showcased the kit, tutorial videos, and some food castings. 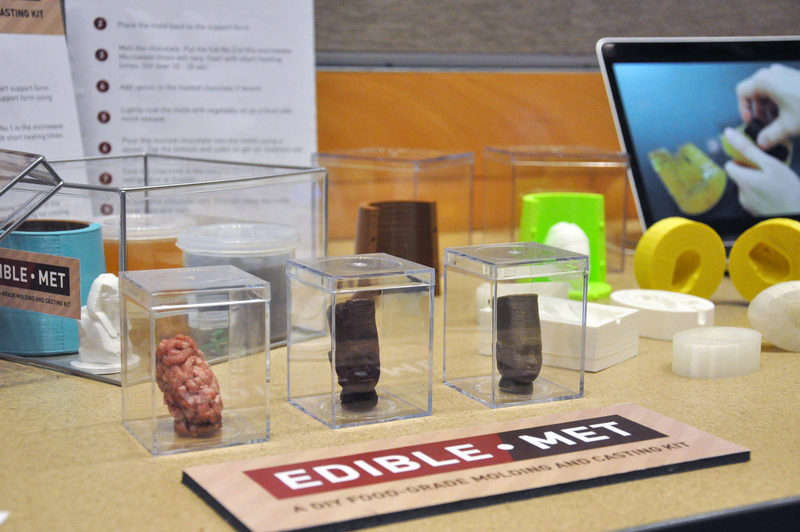 The Edible MET booth at the fall 2014 MediaLab Expo. 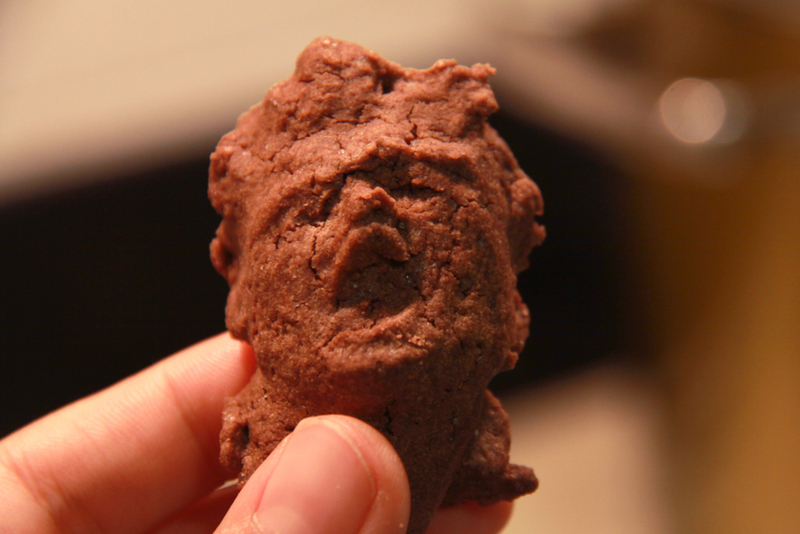 A cookie made with Edible MET. Two castings and the original 3D object on display at the fall 2014 MediaLap Expo. See the coverage on the MET official blog.